Dynamic Digital Advertising's large format graphic design and production services range from trade show graphics to outdoor billboard advertising. 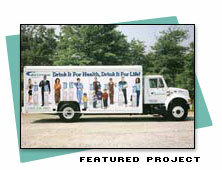 DDA also provides transit advertising, including professional truck sign advertising. Truck sign advertising is designed to capture attention with size, motion and visual impact. DDA's designers have the experience and skills needed to create successful truck sign graphics for your company's transit advertising needs. Difficult to ignore, truck sign advertising is able to reach a significant amount of viewers on a daily basis. These rolling billboards cross highways and rumble through crowded downtown intersections, attracting attention wherever they go. Commuters have only brief moments to observe and retain transit advertising messages such as truck signs, and DDA creates high-impact graphics and copy to market your company's product or service effectively. With Dynamic Digital Advertising, your company can receive the highest quality service and end-result. DDA's experience in designing and producing large format graphics can give you an edge over the competition. Whether your company needs trade show graphics or eye-catching billboards for a large scale marketing promotion, DDA's commitment to higher quality will help bring success to your company.